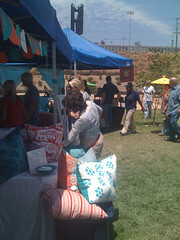 We spent a few hours at the Renegade Craft Fair today down at Los Angeles State Historic Park. Lots of great crafts from yarns, to papers to cards, to shirts to wallets and more. 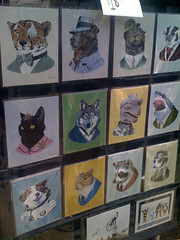 I especially loved these of anthropomorphized animals and more especially, the badger in the upper right. 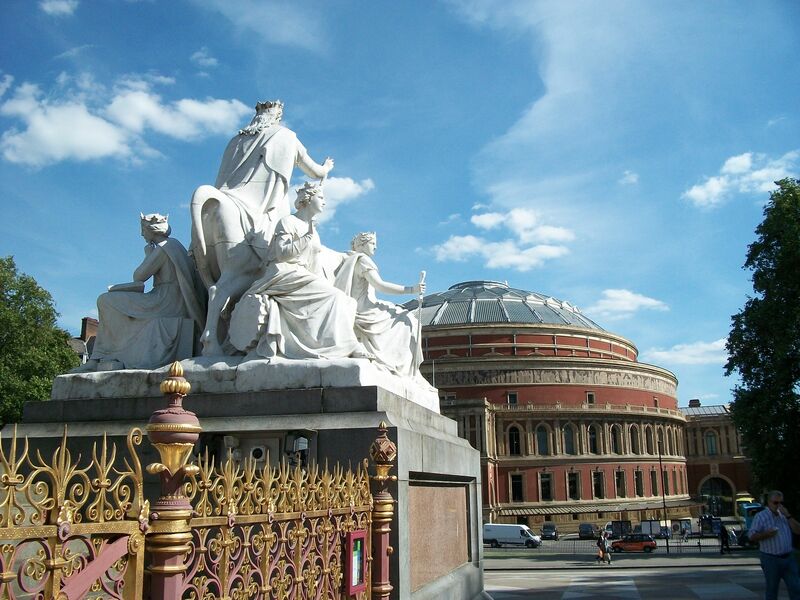 Royal Albert Hall seen from the steps of the Albert Memorial in Hyde Park from our June 2010 UK Trip. Join us for coffees and casual conversation…and some cool, cool, gelato at the Gelato Bar in the Tujunga Village section of Studio City. We sometimes hit Henry’s Tacos down the street for some more substantial food, too. Arrive early to check out the cheese shop across the street or have dinner at Vitellos. I now forget where I heard about this book, but as we are planning a trip back to Sicily (our 3rd) to see “la famiglia” I thought it would be a great way to immerse myself back in that world. As with many American books on Italy, there is a bit of the typical “gee, don’t they do things differently here” stuff, but there is much, much more heart and soul here that make it a worthwhile read. I wish American writers could get over that part of the experience and simply immerse themselves in it. It tends to make them sound naive and a more than a bit ethnocentric. That said, I enjoyed “Four Seasons in Rome” quite a bit. My son was 2 1/2 when we first visited Rome, so I could relate a bit to their struggles with their newborn twins. It must have been so much harder than our visit, but actually “living” there for a year, in an apartment, was certainly an advantage. We were in a nice, residential hotel, but as I found when visiting London on that same trip, a flat of your own is an amazing thing. I found myself reliving my own initial feelings on visiting Rome and later meeting my Italian in-laws. Yes, it truly is a different world, but different in both good and bad ways. The history of Rome, and Italy in general can overwhelm you in some ways. There is such an accretion of history, all layered on top of each other, that it can leave you standing and staring as you try to contemplate the age and complexity of it all. While I might contemplate living in Sicily for a year, under the protective eye of the family, I think living in Rome would be a lot like living in New York City — too much of too much — and would probably burn me out within a few weeks. It is nice to be able to see it through someone else’s eyes and enjoy it vicariously. I just saw via LAist.com that the Max Headroom series will finally be available on DVD August 10, 2010. I loved this 1987 series when it was new, but my lowly, off-air VHS copies gave up the ghost years ago. It would be great to share this with my son, too, as (surprise, surprise) he is interested in geeky things like this. I don’t normally go in for purchasing series on DVD, but this just might make it onto my wish list for my next birthday or other event. 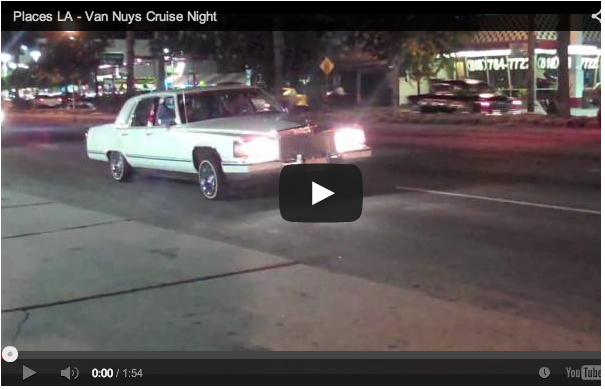 Van Nuys Cruise Night is back! Held the 2nd Wednesday of every month, cool rides cruise “The Boulevard” between Burbank and Oxnard then hang out near the corner. 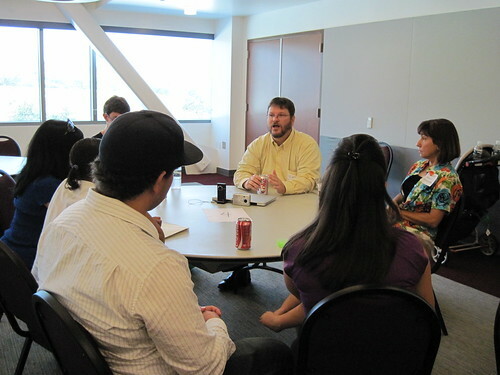 Risa Rosenthal, one of my fellow co-chairs at CareerCampSCV caught this great photo of me in a breakout session on Social Media.